What are we? We are two large 50 player clans that will both participate in Clan Wars that are closely related and will support each other by training players in the reserve clan, and placing good players and graduates from the reserve clan to the Legion. Also we will have monthly contests that reward iTunes money….. Feel free to visit us on our TS Server! We have lots of room. Come to chat and just hang out or to toon. 2. Cheating: If a player is found to have violated any rules for any past or future events whether on, he will be immediately banned. This may seem harsh but I will not tolerate any cheating from any players. 3. AWOL: There is a lot of work that went into the formation of this clan, and I will not tolerate AWOL…. You are free to let any officer in your clan know when you have a family emergency, vacation, event etc. though and we will grant leave accordingly. I expect AT LEAST 2 two (2) log ins onto any aspect of the 501'st clan per week from the lower stat clan and four (4) log-ins from the main clan. Logging into TS3, coming to this website, posting on the clan forum page, or logging in on game are all acceptable. Motto: Nothing can stop the 501st! 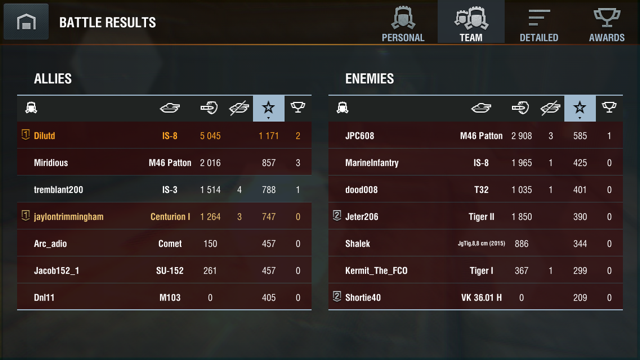 At least one tier ten tank. If you have the required stats for the legion you graduate immediately. To graduate to the Legion you ned to have served 2 months in the reserve without incident or bad reputation and if you have a tier ten. These will be handled on a case by case basis. Port: 9074 feel free to visit with us! Edited by alexbuildit, 29 July 2015 - 05:33 AM. Leader of the 501st, Pm for details. 2. Post one pic (without editing, and results in disqualification) of a battle result score in which you are confident you will hold first place. 3. However many kills you get, your score will be multiplied by: for example 4000 damage and 1 kill only gives you 4000 damage, but 1000 damage and FOUR kills gets you a score of 4000. The highest score automatically wins at the end. So remember that kills and damage are equally important! Good luck and ROLL OUT. Edited by alexbuildit, 16 July 2015 - 07:35 PM. Hey man! Super srry, but again your troll behavior was not agreeable with my co's. 501st is a go! I will be on TS (vs20.tserverhg.com:9074) for the next 30 mins to welcome new recruits! Edited by Shield380, 26 May 2015 - 09:15 PM. Finally can't wait to get involved with everything!! Who here can show me they are the BEST tier two driver in the legion and reserve! WITHOUT USING A TD show me how much damage you can do! Post your best battle that has the most damage. Winner will be announced June 5th. Rules: One entry per person. I will not count edited posts. Winner will be person with the most damage not using a TD. When does this end? Is it after this week? If it goes into summer break Ill do it! No changing your entry.... also I can't see it.... Try again. Organized Play → Clans → Clan Recruitment → RAZ0R & BL4DE Recruiting! Organized Play → Clans → Clan Recruitment → [RAZ0R] Recruiting Still!